Fittingly enough, it was the Nittany Lions captain TOMMY OLCZYK who came through with what was, perhaps, the most influential goal in PENN STATE’s final home contest of this 2013/14 NCAA season. A pivotal late first period strike which left visiting OHIO STATE in the always unenviable position of having to chase the game, so to speak. Additionally, there was also the power play goal from veteran center TAYLOR HOLSTROM seven minutes into the third period that effectively broke the Buckeyes’ proverbial backs and enabled the Nittany Lions to exit the Pegula Ice Arena as 4-2 victors. A pair of early Penn State goals scored by defenseman NATE JENSEN and left wing CURTIS LOIK provided a certain symmetry to the Nittany Lions’ 2013/14 NCAA schedule, then; both Jensen, the 23-year-old redshirt junior from Shorewood, Minnesota, who had sat out eight straight games prior to the start of this weekend series with Ohio State after suffering a concussion against in early February, as well as the Canadian legionnaire Loik, the 21-year-old sophomore from North Vancouver, British Columbia, also tallied goals in the Nittany Lions’ very first game of this season against Army at the beginning of last October. Interesting enough, three of the four goal-scorers (Holstrom, Jensen, Olczyk) from the Nittany Lions’ regular season finale opposite the neighboring Buckeyes on Saturday night are all holdovers from the last Penn State squad that competed at the American Collegiate Hockey Association (i.e. “club hockey” level) only just two years ago. Penn State left wing TOMMY OLCZYK (14), the 23-year-old junior from Long Grove, Illinois, who scored 24 goals in 31 games for the Nittany Lions during their final season of play at the club hockey level two seasons ago, has a quality chance in prime scoring territory but will be denied by Ohio State’s Canadian legionnaire MATT TOMKINS, the 19-year-old freshman goaltender from Sherwood Park, Alberta, who was the seventh round (# 199 overall) choice of the Chicago Black Hawks at the 2012 National Hockey League Draft, during the Big Ten Conference season finale at the Pegula Ice Arena in State College, Pennsylvania. MATTHEW SKOFF, the 22-year-old homegrown sophomore from McKees Rock who also delivered a quality start in his last appearance against visiting Wisconsin seven days earlier, put forth a solid effort in between the pipes to complete his work at the Pegula Ice Arena this term. By stopping 27 of 29 Ohio State attempts on goal, the usually realiable Skoff (21 games, 3.17 average, .898 save percentage) registered his seventh victory of this season — a figure which just so happens to matches the Nittany Lions’ total number of triumphs this term. Clearly, it is Skoff who has earned the right to enter the Big Ten Conference tournament as Penn State’s first choice. DYLAN RICHARD, the 21-year-old freshman from Sherwood Park, Alberta, continued with the noticeably improved form he has shown as of late while contributing two key assists against the visiting Buckeyes. The Canadian legionnaire concludes his first year on a very positive note having totaled 11 points (three goals, eight assists) in the Nittany Lions’ last 13 regular season games. Richard (28 ga, 4 go, 14 pts, -3 def rat), who had multiple-point outings in Big Ten Conference matches against Michigan, Wisconsin and Ohio State (twice), will also most likely finish this 2013/14 NCAA campaign in second place on the Penn State scoring chart for freshmen. And so, the Nittany Lions close out their official NCAA regular season account with the experience-filled record of 7 wins against 25 losses with 2 ties. Penn State shot-stopper MATTHEW SKOFF, the second-year player who has been the goaltender of record for 16 of the 20 victories that the Nittany Lions have been able to register in school history since making the jump to the NCAA Division I level in men’s ice hockey, focuses intently on the rebound as buzzing Ohio State right wing ANTHONY GRECO (14), the undersized 20-year-old sophomore from Fairbault, Minnesota, gazes from a safe distance during the Big Ten Conference season finale at the Pegula Ice Arena. If only the OTTAWA SENATORS could skate in the same league as the PENN STATE NITTANY LIONS, then the chances of the coveted Stanley Cup returning to the capital city of Canada might be improved tremendously. Even the feel-good-articles-no-matter-what-happens professional propagandists are obviously struggling to cope mightily these days. This must be what transpires when there are no more life-saving bone marrow transplants to laud. Or any money-raising dance marathons to promote. Penn State goaltender P.J. MUSICO (1), the 23-year-old junior from Orange, California, who began this term as third-string on the depth chart but was making his third start in the Nittany Lions’ last four games as this 2013/14 NCAA campaign concludes, blocks the centering pass from Ohio State right wing NICK SCHILKEY (37), the 19-year-old rookie from Marysville, Michigan, who topped all Buckeyes freshmen with both 12 goals and 24 points this winter, during the Big Ten Conference men’s ice hockey match at the Pegula Ice Arena in State College, Pennsylvania. Meanwhile, it might be prudent to remind Mr. Brunskill that, speaking rather bluntly, the Nittany Lions have not been able to muster many high quality scoring chances all season long, this even against some of the weaker schools in all of NCAA men’s ice hockey such as Rochester Institute of Technology and Robert Morris University. The fact of the matter is that, very early in the season, Penn State head coach GUY GADOWSKY adopted a policy that placed a premium on “getting pucks to the net” as soon as the slightest opportunity presents itself. Considering the Nittany Lions’ overall lack of technical skill but given that Penn State do have a number of forwards with imposing physical attributes, this simplistic strategy was, indeed, a prudent one to implement. The only trouble is, the Nittany Lions’ opponents already know full well what is coming in advance and, therefore, are effectively able to adopt measures specifically designed to deal with Penn State’s low-percentage attack. It was not an accident of nature that the Nittany Lions were unable to score more than two goals in an eye-opening 23 of their first 33 contests during this most disappointing 2013/14 NCAA campaign — underachieving Penn State definitely went backwards in their second season, contrary to popular belief. Penn State Canadian legionnaire CURTIS LOIK (15), the 20-year-old sophomore left wing from North Vancouver, British Columbia, is unsuccessful with his attempt to catch Ohio State rookie goaltender CHRISTIAN FREY (30), the 20-year-old freshman from Arlington, Texas, who joined the Buckeyes in mid-winter from the Dubuque Fighting Saints of the developmental United States Hockey League but adapted to the NCAA Division I level immediately, asleep on the job during the landmark Big Ten Conference men’s ice hockey game at the Pegula Ice Arena in State College, Pennsylvania. Many spectators disguised as empty seats watch as Ohio State netminder CHRISTIAN FREY (13 ga, 2.29 avg, .930 svpct) sweeps the puck away from forechecking Penn State right wing KENNY BROOKS (13) during the Big Ten Conference men’s ice hockey match at the obviously less-than-full Pegula Ice Arena in State College on Friday night … the official reported attendance figure of 5,767 fans for the neighboring Buckeyes’ historic first visit to The Peg on Friday night was the second-lowest total of the 17 home games the Nittany Lions have contested at Penn State’s brand new athletic facility thus far. After finding itself trailing the visitors by two goals in the first period on an afternoon that had been designated for special celebrations to honor the school’s 50th anniversary season of NCAA Division I ice hockey, the home side rallied to score five unanswered goals over the final forty minutes as potent OHIO STATE downed sliding PENN STATE 5-2 and completed the two-game sweep in the Big Ten Conference weekend series. The never-say-die Nittany Lions — who have now dropped all eight of its Big Ten Conference matches as well as eight NCAA contests, overall, on the trot — jumped out to a very early lead only two and a half minutes in. Defenseman CONNOR VARLEY (15 ga, 0 go, 1 as, – 10 def rat), the homegrown sophomore from Lansdale who led all Penn State rearguards in scoring last season, connected with Canadian legionnaire DYLAN RICHARD (16 ga, 2 go, 5 pts) in the slot and the soon-to-be 21-year-old freshman from Sherwood Park, Alberta, wristed the puck past exposed Ohio State freshman netminder CHRISTIAN FREY (6 ga, 2.19 avg, .936 svpct) to score his second goal of this season. It was a noteworthy achievement for the entire Nittany Lions team considering the fact that Penn State had just played six straight games — a total of 600 minutes of ice hockey — without ever leading at any single point in any of those tilts. Less than seven minutes in, the Nittany Lions found themselves ahead 2-0 after left wing CASEY BAILEY (18 ga, 3 go, 5 pts), the 22-year-old sophomore from Anchorage, Alaska who topped Penn State with 27 points (14 goals) in 27 NCAA games last season, corralled a loose puck and successfully fired a wrist shot through a screen. JACOB FRIEDMAN (7 ga, 0 go, 2 pts), the 23-year-old junior from West Bloomfield, Michigan, who has appeared sparingly this season, initiated the scoring play with a shot that ricocheted off of Richard in front. Bailey, who notched a hat trick against the Buckeyes at the inaugural Three Rivers Classic holiday tournament thirteen months ago, had also been the last Nittany Lion to have scored a goal that had given Penn State their last advantage on the scoreboard (against powerful Boston College at the 2nd Annual Three Rivers Classic several weeks ago) prior to this most recent Big Ten battle in Columbus. However, as has been often the case this term, penalties would lead straight to the Nittany Lions’ undoing on this most special occasion for The Ohio State University. Almost immediately after the All-Buckeye Team (as voted by the OSU ice hockey fans, themselves) was introduced to the crowd during the first intermission, head coach STEVE ROHLIK’s charges skated out and scored two power play goals within a minute and a half of each other to open the second period. The first strike from Canadian legionnaire TANNER FRITZ (19 ga, 4 go, 23 pts), the 22-year-old junior center from Fort St. John, British Columbia, who is tied for second among all Big Ten Conference players with nineteen assists this season, directly resulted from a three-way, tic-tac-toe passing play that certainly was highlight reel stuff of superior quality. Fritz did very well to receive a fine pass from Ohio State freshman right wing NICK SCHILKEY (24 ga, 8 go, 17 pts) on the backhand before losing Penn State netminder MATTHEW SKOFF (13 ga, 3.44 avg, .891 svpct) with a lightning-fast move to the forehand. Big Ten Conference scoring leader RYAN DZINGEL (24 ga, 17 go, 36 pts), the 21-year-old junior from Wheaton, Illionis, who was chosen by the Ottawa Senators in the seventh round (# 204 overall) of the 2011 National Hockey League Draft, hauled the Buckeyes level while manning the point on the power play with a big slapshot from the top of the two face-off circles. It was a sixth goal in three career games against the Nittany Lions for the highly influential Dzingel, who also initiated the swift movement that brought about the first Ohio State goal from Fritz. Dzingel was involved in what would prove to be the game-winning goal just 67 seconds before the arrival of the second intermission, as well. ANTHONY GRECO (20 ga, 3 go, 11 pts), the diminutive sophomore (5’10) right wing from Fairbault, Minnesota, squeezed the puck past Skoff from a very tight angle to complete the rally and provide the Buckeyes with their first lead of the afternoon. There could never be any real way back for Penn State, who would only manage four shots on target over the course of the final twenty minutes. MAX MCCORMICK (24 ga, 10 go, 24 pts), the 21-year-old junior left wing from De Pere, Wisconsin, netted his third goal of the two-game weekend series with the visiting Nittany Lions roughly a minute and a half into the third period with a long wrist shot from the right point. McCormick, the sixth round choice of the Ottawa Senators (# 177 overall) at the 2011 NHL Draft who had been stuck in an eight-game scoring slump until the arrival of Penn State (now 4-17-1) in Columbus, is now tied for fifth place on the Big Ten Conference scoring chart this season. Right wing DARIK ANGELI (23 ga, 7 go, 11 pts), the 23-year-old junior from Littleton, Colorado, wrapped things up for a celebratory Ohio State (now 14-9-1) with an empty net goal late. Ohio State left wing RYAN DZINGEL (18), the Hobey Baker Memorial Award candidate who has now registered points in eighteen of the Buckeyes’ first twenty-four NCAA games this season, is thwarted here by Penn State netminder MATTHEW SKOFF but the junior scoring ace still significantly padded his lead on the Big Ten Conference chart by posting three goals and three assists in the two-game series with the visiting Nittany Lions. A pair of lightning bolts only twenty-six second apart in the early part of the second period broke open what had been, up to that point, a free-flowing, back-and-forth contest while providing the hosts a firm grip which would never be loosened as celebratory OHIO STATE skated away from PENN STATE 5-1 in the first official Big Ten Conference match between the two schools. The Buckeyes, who were successful in avenging last season’s 5-4 loss to the fledgling Nittany Lions at the inaugural Three Rivers Classic holiday tournament in most emphatic fasion, then, actually went into this contest with visiting Penn State able to dress only five natural defensemen. Ohio State were already without the services of two injured blueliners, the Canadian legionnaires CRAIG DALRYMPLE (14 ga, 0 go, 6 pts, + 11 def rat) as well as CURTIS GEDIG (20 ga, 1 go, 4 pts, + 5 def rat), and then CLARK CRISTOFOLI (5 ga, 0 ga, 0 pts, + 1 def rat), the homegrown junior from Lewis Center whose father appeared briefly in the vaunted National Hockey League, took a leave of absence on account of the passing of a grandparent. Veteran forward ALEX LIPPINCOTT (11 ga, 1 go, 0 as), the homegrown senior from Akron who is, in fact, the third-most experienced player on the entire Ohio State roster with 102 career NCAA games (11 go, 23 pts) under his belt going into the Penn State battle, was drafted by the defensive corps to fill out the ranks. 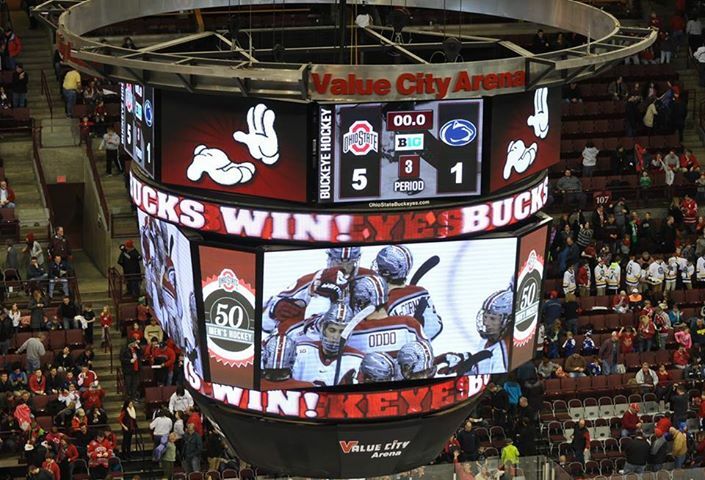 Ohio State chose to make this two-game set with neighboring Big Ten Conference rival Penn State the weekend it wanted to formally celebrate the 50th anniversary of NCAA Division I ice hockey in Columbus. Appropriately enough, a strong crowd of 6,856 spectators showed up out on Friday night to cheer the Buckeyes — this figure was well above the 3,925 fans per game average that Ohio State had drawn on its first fourteen homes dates on this 2013/14 schedule. 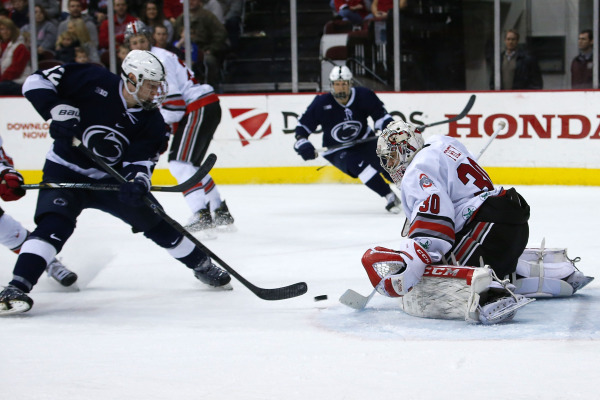 Nevertheless, in this atmosphere the Nittany Lions were able to come out and generate a good number of chances in the opening twenty minutes … only to find themselves held at bay by in-form Buckeyes freshman goaltender CHRISTIAN FREY, who finished with 36 saves. Ohio State snapped the scoreless deadlock almost halfway through the first period after Canadian legionnaire JUSTIN DASILVA, the towering junior (6’6″ 222 lbs) defenseman from Cambridge, Ontario, let go off a shot from the point that was saved by Penn State goaltender EAMON MCADAM. On hand in the slot, however, to collect the rebound was Buckeyes playmaker TANNER FRITZ, the skillful junior imported from Fort St. John, British Columbia, who immediately issued a nifty, behind-the-back feed for MAX MCCORMICK at the side of the net on the right wing. A left-handed shot in the perfect shooting position, the junior from De Pere, Wisconsin, had no trouble finishing past McAdam while putting an end his own personal eight-game scoring drought, as well. The hosts added a vital second goal almost five and half minutes into the second period after checking line winger MATT JOHNSON, the junior from Stillwater, Minnesota, hustled after a loose puck in the Penn State offensive zone and then finished off the chance he had originally created by firing home a rebound in the slot. McCormick, the sixth round selection (# 177 overall) of the Ottawa Senators at the 2011 NHL Draft, netted his second goal of the game after the Big Ten Conference’s leading scorer, RYAN DZINGEL, launched a big slapshot from the point with the Buckeyes enjoying a power play. Dzingel, the junior from Wheaton, Illinois, who was chosen by the same Ottawa Senators in the seventh round (# 204 overall) of that same 2011 NHL Draft, scored the first of his two goals by beating the Penn State rookie netminder with a backhand move after being sent into the clear on a shorthanded break by NICK ODDO, the junior center from Omaha, Nebraska, who is in the midst of his best season for Ohio State, with roughly six minutes remaining in the second period. Penn State avoided the indignity of a shutout after left wing DAVID GOODWIN (20 ga, 5 go, 11 pts), the 21-year-old freshman from Des Peres, Missouri, found the back of the Buckeyes net with a long wrist shot from the left face-off circle but it was indeed, entirely too little far too late. The futile move by the Nittany Lions head coach GUY GADOWSKY to lift the goaltender in favor of a sixth skater with more than half of the final period yet to be played was certainly ill-advised, to be polite. The ever-dangerous Dzingel soon capitalized on this deplorable situation and tracked down an errant puck deep in the Ohio State offensive zone to easily register his second goal of the evening with Penn State’s net officially unguarded. Ohio State left wing RYAN DZINGEL (18), the prolific 21-year-old who netted a hat trick against the NCAA Division I newcomers at the inaugural Three Rivers Classic holiday tournament in Pittsburgh thirteen months ago, doubled his career scoring total against the Nittany Lions by adding another three points at the expense of visiting Penn State on Friday night in the capital city of Ohio. 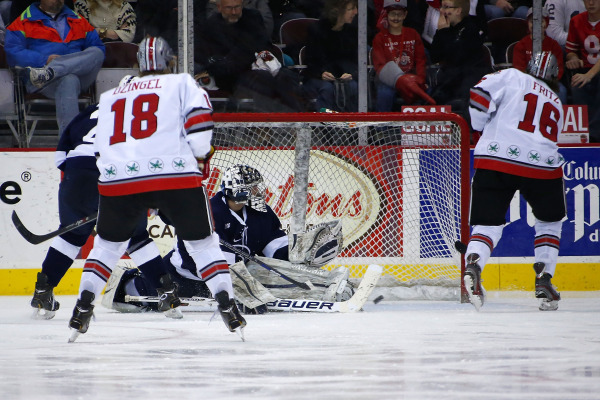 The Ohio State University are rather fortunate to have that special but rare sort of ice hockey player that is RYAN DZINGEL, the new Big Ten Conference’s scoring leader at present. Indeed, the 21-year-old junior from Wheaton, Illinois, is exactly the kind of skillful and creative player that can keep the random spectator on the edge of the seat in almost unbearable anticipation of the Buckeye ace’s next shift on the ice. It is, perhaps, more than just a coincidence, then, that it was the seventh round selection (# 204 overall) of the Ottawa Senators at the 2011 National Hockey League Draft who, only just a couple of weeks ago, became the very first performer in history to ever register three goals in an official Big Ten Conference game. Ohio State scoring star RYAN DZINGEL (18) turns the corner on Penn State defenseman NATE JENSEN (24) during the consolation match of the inaugural Three Rivers Classic holiday tournament at the Consol Energy Center in Pittsburgh, Pennsylvania, thirteen months ago. The OHIO STATE BUCKEYES (12-9-1) clearly have everything to play for when the visiting PENN STATE NITTANY LIONS (4-15-1) pay a visit to the True Value Center in Columbus this weekend. Aside from the built-in rivalry that always exists whenever two major academic institutions from bordering states get together and drop the puck, rookie head coach STEVE ROHLIK’s squad should already be sufficiently motivated to do well because The Ohio State University has, in fact, chosen this particular series against the neighboring Pennsylvania State University to highlight the school’s celebration of its 50th season playing NCAA Division I ice hockey. 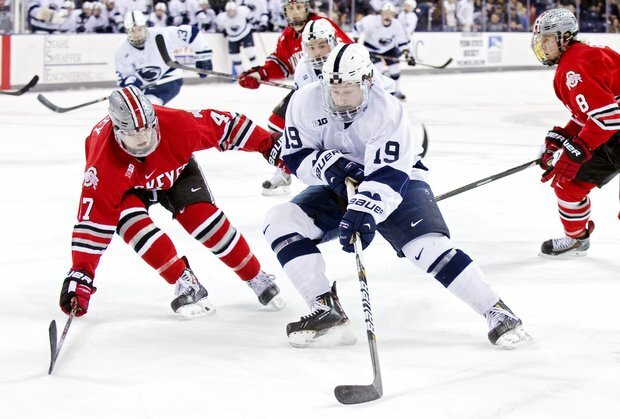 Furthermore, not only could the Buckeyes gain a measure of revenge for last season’s 5-4 loss to the fledgling Nittany Lions in Pittsburgh, Ohio State could also potentially vault into third place in the Big Ten Conference standings by sweeping developing Penn State on home ice. Not so shabby of a position to be in for an Ohio State side that lost its first three games to open this season and has already used no fewer than four different goaltenders, three of whom are unproven freshman. The Buckeyes are rather well stocked with a rich junior class including legitimate Hobey Baker Memorial Award candidate RYAN DZINGEL and are primarily powered by a high octane offense which is currently tied for fifth place in the entire country with the per game average of 3.50 goals scored. The Ohio State defense, meanwhile, has conceded only one goal (against against Big Ten adversaries Michigan State, Minnesota and Wisconsin) in three of its last five games and looks to continue that sort of good form against a lightweight Penn State squad that is ranked 50th out of 59 Division I teams in goal-scoring this season. Rohlik has deployed several different forward line combinations so far this season but the engine that drives the Buckeyes’ offensive attack is, without question, Dzingel (22 ga, 14 go, 30 pts), the 21-year-old junior from Wheaton, Illinois, who led Ohio State with both 16 goals and 38 points in 40 NCAA games as a sophomore last season. The Buckeyes’ scoring ace is noted for his good speed and menacing shot but is also quite capable of performing in the playmaker’s role, as well. Certainly, the Penn State defensive corps will need to be cognizant of the player who was the seventh round selection (# 204 overall) of the Ottawa Senators at the 2011 National Hockey League Draft at all times, whether the ever-dangerous Dzingel is positioned in the center or, as if often the case, out on the left wing. Left wing MAX MCCORMICK (22 ga, 7 go, 21 pts), the 21-year-old junior from De Pere, Wisconsin, who was the sixth round choice (# 177 overall) of the Ottawa Senators at the 2011 NHL Draft, is the second-leading scorer for Ohio State this term but is, at present, in the midst of an eight-game goalless streak. McCormick had been spending most of his time this season on a line with Canadian legionnaires ALEX SZCZECHURA (22 ga, 6 go, 19 pts), the highly experienced, 23-year-old senior center from Brantford, Ontario, and creative right wing TANNER FRITZ (17 ga, 3 go, 19 pts), the 22-year-old junior from Fort St. John, British Columbia. 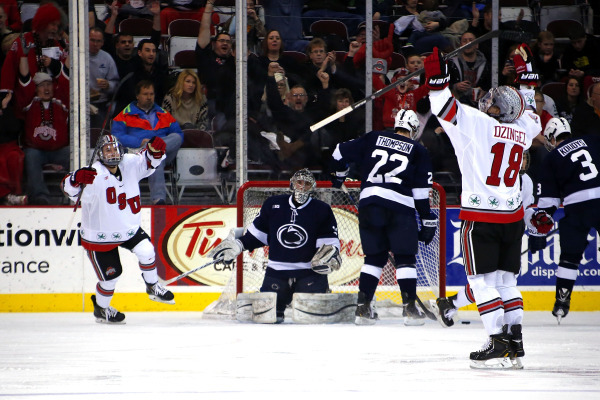 The slumping trio was broken up last Saturday night when the Buckeyes knocked off # 9 ranked Wisconsin 3-1 in Madison but could be re-united when the Nittany Lions hit the Value City Arena’s ice at the Jerome Schottenstein Center. Ohio State left wing MAX MCCORMICK (17) was the second-leading marksman for the Buckeyes last season having found the back of the net fifteen times and currently counts 32 goals and 74 points in 89 career NCAA games. NICK ODDO (22 ga, 7 go, 22 pts), the 23-year-old junior center from Omaha, Nebraska, is enjoying a breakout campaign and has already scored as many goals this season as he did in his first two campaigns at Ohio State put together. Oddo, who has often been featuring on a line with the prolific Dzingel this term and tallied a vital goal in the upset victory over the Wisconsin Badgers, is just one ten juniors on the roster of a Buckeyes team that finished with a record of 16 wins against 17 losses with seven draws last season. Canadian legionnaire CHAD NIDDERY (18 ga, 4 go, 4 pts), the 23-year-old center from Penticton, British Columbia, in addition to rugged MATT JOHNSON (19 ga, 2 go, 5 pts), the 22-year-old right wing from Stillwater, Minnesota, are still two more juniors who bring a fair amount of valuable experience to the checking line’s table. DARIK ANGELI (21 ga, 6 go, 10 pts), the 23-year-old junior right wing from Lakewood, Colorado, who also scored a goal in Ohio State’s noteworthy triumph in Madison last weekend, has rebounded from a lackluster sophomore campaign and often skates with center TYLER LUNDEY (22 ga, 4 go, 7 pts), the 22-year-old sophomore from Middleton, Wisconsin, who has now equaled his goal production from his freshman term. The diminutive ANTHONY GRECO (18 ga, 2 go, 10 pts), a useful 20-year-old sophomore winger from Fairbault, Minnesota, is one of many Buckeyes who have already established new career marks on the scoring charts this season or are about to do so very soon. Reliable veteran ALEX LIPPINCOTT (11 ga, 1 go, 0 as), the 21-year-old homegrown senior from Akron, is one of only three Ohio State skaters on this year’s team who have appeared in more than 100 NCAA contests in his career. The prize freshman recruit for the first-year head coach Rohlik has been versatile NICK SCHILKEY (22 ga, 8 go, 15 pts), the 19-year-old from Marysville, Michigan, who notched a goal in each game against Wisconsin last weekend and, indeed, has shown himself to be one of the very best newcomers in the entire Big Ten Conference up to this point. Undersized freshman DAVID GUST (14 ga, 5 go, 9 pts), the 19-year-old from Orland Park, Illinois, has been coming on like gangbusters as of late for the Buckeyes after being used sparsely at the beginning of this season. The emerging Gust has scored four goals in Ohio State’s last nine games and skated on a line with the explosive Dzingel against the Badgers this past Saturday night. Ohio State defenseman CRAIG DALRYMPLE (24), the 22-year-old sophomore from Kippen, Ontario, who has now recorded impressive totals of 23 points and a + 17 plus/minus defensive rating after his first 50 career NCAA games for the Buckeyes, has been sidelined with an undisclosed injury and could very well miss the upcoming two-game series with neighboring Big Ten Conference rival Penn State in Columbus. The Buckeyes defensive corps, goaltenders notwithstanding, has been forced to withstand a seemingly never-ending string of injuries all throughout this 2013/14 NCAA campaign. Ohio State skated in Wisconsin without their two most productive blueliners from last term —Canadian legionnaires CRAIG DALRYMPLE (14 ga, 0 go, 6 pts, + 11 def rat) as well as CURTIS GEDIG (20 ga, 1 go, 4 pts, + 5 def rat), the 22-year-old senior from West Kelowna, British Columbia, who was the seventh round pick (# 204 overall) of the New Jersey Devils at the 2009 NHL Draft and is the most experienced Buckeyes player on the roster with 120 career NCAA games (6 go, 45 pts, + 12 def rat) already under his belt. The monstrous Dalrymple (6’5″ 215 lbs) led all Ohio State defenders in scoring with 17 points (three goals) a year ago but been out of action for the last three games. Canadian legionnaire SAM JARDINE (21 ga, 0 go, 8 pts, + 2 def rat), the improving 20-year-old sophomore from Lacombe, Alberta, who was chosen in the sixth round (# 169 overall) of the 2011 NHL Draft by the Chicago Black Hawks, is the most promising professional prospect on the Buckeyes’ roster, at least in terms of overall draft status. DREW BREVIG (19 ga, 2 go, 10 pts), the 21-year-old freshman from Lakeville, Minnestoa, has been the highest scoring rearguard for Ohio State thus far while Canadian legionnaire JUSTIN DASILVA (19 ga, 4 go, 8 pts, -1 def rat), the monstrous (6’6″ 222 lbs) junior from Cambridge, Ontario, has suddenly found an ability to find the back of the net with unprecedented regularity. Also contributing on the Buckeyes’ blue line has been Canadian legionnaire JOSH HEALEY (18 ga, 1 go, 3 pts, + 1 def rat), the 20-year-old freshman from Edmonton, Alberta. AL MCLEAN (16 ga, 0 go, 1 pts, – 4 def rat), the 23-year-old junior from Duluth, Minnesota, as well as CLARK CRISTOFOLI (5 ga, 0 go, 0 pts, + 1 def rat), the 21-year-old homegrown junior from Lewis Center whose father, Ed Cristofoli, appeared briefly with the storied Montreal Canadiens in the vaunted National Hockey League almost a quarter century ago now, provide depth on defense. 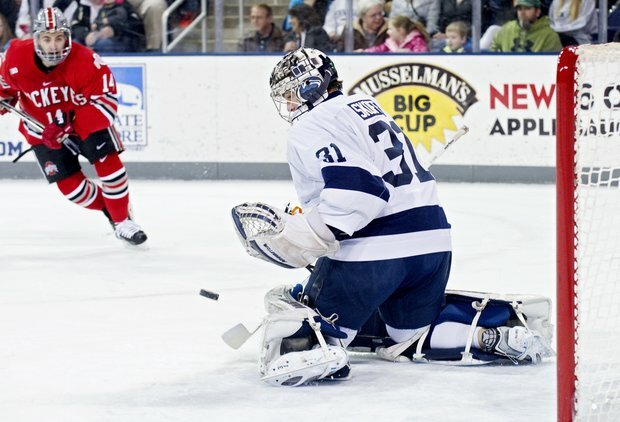 In the consolation match with Penn State at the inaugural Three Rivers Classic holiday tournament in Pittsburgh last season, Ohio State elected to rest its senior goaltender who would ultimately be honored as the NCAA (West) First Team All-America and opted to start its freshman backup instead. Thirteen months later, as events have progressed in Columbus, the Buckeyes now have a trio of freshman netminders from which to choose. Canadian legionnaire MATT TOMKINS (13 ga, 2.66 avg, .912 svpct), the 19-year-old from Sherwood Park, Alberta, who was tabbed in the seventh round (# 199 overall) of the 2012 NHL Draft by the Chicago Black Hawks, and brand new recruit CHRISTIAN FREY (4 ga, 2.54 avg, .923 svpct), the 20-year-old from Arlington, Texas, who was only just recently standing between the pipes for the Dubuque Fighting Saints in the United States Hockey League, will likely split the goaltending load, as they have been doing for the past couple of series. Ohio State third-string netminder LOGAN DAVIS (5 ga, 2.21 avg, .909 svpct), the 19-year-old homegrown freshman from Upper Arlington, started four games in succession for head coach Steve Rohlik’s depleted squad earlier this season after one Buckeyes goaltender went down injured not so long after another had decided to leave school suddenly. The consolation match at the inaugural THREE RIVERS CLASSIC holiday tournament one year ago was actually only the fourteenth time in history that the NCAA’s newest Division I men’s ice hockey team had ever dropped the puck with another school also competing at the very highest collegiate level. But fledgling PENN STATE’s surprising 5-4 triumph over neighboring Big Ten Conference rival OHIO STATE, however, was far more than just the first truly noteworthy, landmark upset that the transitioning Nittany Lions team had ever managed to pull off. Indeed, it was a genuine watershed moment as head coach GUY GADOWSKY’s squad would go on from there to knock off no fewer than three proud programs that had all qualified for the prestigious Frozen Four at the annual NCAA men’s ice hockey tournament within the past five seasons — Vermont, Michigan State as well as a nationally ranked Wisconsin — while concluding a stunningly sensational debut season. Penn State Canadian legionnaire CURTIS LOIK (15), the 19-year-old freshman left wing from North Vancouver, British Columbia, shoots the puck past Ohio State netminder COLLIN OLSON (39), the 18-year-old freshman from Apple Valley, Minnesota, who was chosen in the sixth round (# 159 overall) of the 2012 National Hockey League Draft by the Carolina Hurricanes, and levels the contest for the Nittany Lions almost eight minutes into the first period at the Consol Energy Center in Pittsburgh. Penn State center TAYLOR HOLSTROM (28), the 22-year-old redshirt sophomore from Yorba Linda, California, who shot nine goals in 36 games for Mercyhurst University during the 2010/11 NCAA campaign, reacts after fashioning the first of his two goals against Ohio State in the consolation game of the inaugural Three Rivers Classic holiday tournament …… including the pair surrendered by the Buckeyes in Pittsburgh, the slow starting Holstrom closed out his 2012/13 campaign by scoring eight goals in the Nittany Lions’ last eleven games. Penn State left wing CASEY BAILEY, the 21-year-old freshman from Anchorage, Alaska, who would finish the Nittany Lions’ inaugural season at the Division I level as the team’s leading scorer with 27 points in 27 NCAA games, fires the first of his two goals versus Ohio State at the Consol Energy Center. Penn State fell behind to more experienced Ohio State only a little less than four minutes into the 2012 Three Rivers Classic consolation game but soon recovered to score three times without reply before the end of the opening period. Although the talented sophomore RYAN DZINGEL registered his first collegiate hat trick and the Buckeyes were able to draw within one goal late after pulling their goaltender with more than three and a half minutes to play, the Nittany Lions defensive corps was ultimately able to hold out just long enough to get the job at hand done. Penn State goaltender MATTHEW SKOFF, the 21-year-old homegrown freshman from McKees Rock, made enough of a difference by stopping 36 Ohio State shots. MAX GARDINER, the third round selection (# 74 overall) of the St. Louis Blues at the 2010 NHL Draft who transferred in from the traditionally strong University of Minnesota, racked up three assists for the Nittany Lions while Canadian legionnaire LUKE JUHA, the 19-year-old freshman defenseman imported from Mississauga, Ontario, added a pair of helpers for Penn State, as well. Ohio State left wing RYAN DZINGEL (18), the skillful 20-year-old sophomore from Wheaton, Illinois, who was tabbed by the Ottawa Senators in the seventh round (# 204 overall) of the 2011 NHL Draft and then went on to lead the Buckeyes with 17 assists in 33 NCAA games as a collegiate rookie, prepares to shoot the puck into Penn State’s wide open net during the consolation game of the inaugural Three Rivers Classic holiday tournament at the Consol Energy Center in Pittsburgh, Pennsylvania. In a titanic clash of two traditional gridiron football rivals that just so happened to produce a wonderfully exciting game certainly most well qualified to serve on this historic inaugural night of Big Ten Conference ice hockey, it was a genuine, long home run pass resulting in a breakaway goal that powered the # 3 MICHIGAN WOLVERINES to a pulsating 4-3 overtime victory over the upset-minded OHIO STATE BUCKEYES. Michigan stormed to an early lead less than three minutes into the contest when center TRAVIS LYNCH, the homegrown junior from White Lake, scored his first goal of the season on a simple rap around that Ohio State netminder LOGAN DAVIS might have done more to prevent. 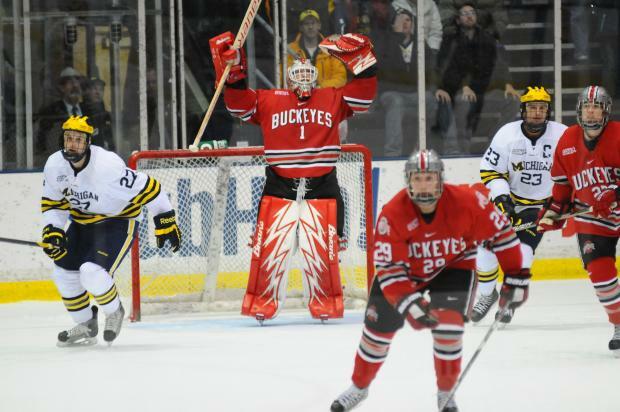 Davis, the homegrown freshman from Upper Arlington who began this season as the third-string goaltender on the Buckeyes roster behind two players who have already been drafted by National Hockey League clubs, would settle himself down soon enough, however. And the visitors found themselves level late in the first period when RYAN DZINGEL, the junior left wing from Wheaton, Illinois, who was the seventh round selection (# 204 overall) of the Ottawa Senators at the 2011 NHL Draft, scored his Big Ten Conference-leading eighth goal of this 2013/14 campaign with a one-time blast from the top of the right faceoff circle while the Buckeyes were skating on the power play. The Wolverines went back to the lead almost seven minutes into the second period after center J.T. COMPHER, the highly-touted freshman from Northbrook, Illinois, who was tabbed in second round (# 35 overall) of the 2013 NHL Draft by the Buffalo Sabres, backhanded a rebound past Davis to score his third goal of this season with Michigan enjoying the man advantage. The hosts had a big opportunity to extend their lead in after fourth line right wing EVAN ALLEN, the homegrown freshman from Sterling Heights who had netted two goals in his first eight collegiate games for the Wolverines coming into this much anticipated contest with the Buckeyes, was obstructed from behind while on the breakaway. But Davis was able to shake off any ill-effects of his collision with Allen and triumph in the resulting one-on-one duel of opposing rookies on the penalty shot attempt. Once again, Ohio State saw itself skating on level terms in the latter half of the second period after capitalizing on another power play situation. MAX MCCORMICK, the junior left wing from De Pere, Wisconsin, who was sixth round selection (# 177 overall) of the Ottawa Senators at the 2011 NHL Draft, was looking to set up a teammate at the back door on the other side of the net but his pass ended up in the back of the Wolverines’ net after deflecting off of a Michigan defender’s skate. But the # 3 ranked team in all college hockey would regain the lead yet again before the second intermission had even arrived. With less than 20 seconds left in the second period, the influential Compher (12 ga, 3 go, 12 pts) won a key faceoff cleanly and Canadian legionnaire ALEX GUPTILL, the junior left wing from Newmarket, Ontario, who was the third round choice (# 77 overall) of the Dallas Stars at the 2010 NHL Draft, quickly snapped off a deadly accurate shot and beat the Buckeyes netminder Davis. Guptill, of course, led Michigan with both 16 goals as well as 36 points while skating in 38 NCAA games last season and, for most of the third period, it looked as if his fifth goal of this season just might stand up to defeat the eternal enemy Ohio State. This in large part due to the form of previously unheralded Michigan backstop ZACH NAGELVOORT, the homegrown freshman from Holland who has seeingly come out of nowhere to establish himself as the Wolverines’ clear number one netminder (9 ga, 1.65 avg, .945 svpct) at the moment. Indeed, only three minutes and thirteen seconds remained in the contest when Ohio State’s Canadian leagionnaire TANNER FRITZ, the undrafted junior from Grande Prairie, Alberta, who now totals 11 assists and 12 points in only eight NCAA games this season, was able to steal the puck along the boards behind the net in the Michigian zone and quickly center the puck into the slot. Racing in to meet such an inviting pass was Buckeyes left wing ANTHONY GRECO, the undersized sophomore (5’10″ 174 lbs) from Fairbault, Minnesota, who had no trouble beating Nagelvoort to notch his second goal of this 2013/14 season. And so, perhaps appropriately enough given the historic ocassion at hand, a little overtime hockey, at the minimum, would prove to be necessary. Ohio State had the first three of the first four shots on goal in the overtime period but were still destined to suffer an inglorious fate. Following a faceoff just outside the Michigan blue line, experienced Wolverines defenseman and team captain MAX BENNETT, the senior from Narragansett, Rhode Island, who was reserved in the third round (# 79 overall) of the 2009 NHL Draft by the Montreal Canadiens, caught the Buckeyes defense napping and hit streaking ANDREW COPP with a long home run pass. The Michigan center made no mistake with his breakaway opportunity and, in doing so, tied Dzingel for the conference lead with his eighth goal of the season before being swarmed by overjoyed constituents. Michigan Wolverines center ANDREW COPP (18), the quite-literally homegrown sophomore from Ann Arbor who was chosen by the Winnipeg Jets in the fourth round (# 104 overall) of the 2013 NHL Draft last summer, is behind the Ohio State Buckeyes’ inexperienced Canadian legionnaire JOSH HEALEY (47), an undrafted freshman defenseman from Edmonton, Alberta, and prepared to shoot the game-winner in overtime to settle the very first Big Ten Conference men’s ice hockey match ever contested at the venerable Yost Ice Arena. Need something to be thankful for this holiday season? … Well, the brand new ice hockey league of the BIG TEN CONFERENCE will drop the puck on Friday night and officially begin its historic first weekend of competition, which includes a noteworthy trip by the OHIO STATE BUCKEYES meet its most famous rival, the MICHIGAN WOLVERINES, at the Yost Ice Arena in Ann Arbor. And not a moment too soon, either, so God bless! The men’s ice hockey teams of the University of Michigan and The Ohio State University will oppose one another for the 117th time in the long-running frozen feud that dates back exactly half a century. Indeed, it was on February 8th in 1964 that the fledgling Buckeyes and the experienced Wolverines clashed for the first time ever with Michigan, who would cap off their 1963/64 campaign by being crowned NCAA national champions for the seventh time in school history, skating its way to a landslide victory. In fact, the Wolverines’ 21-0 triumph over the Ohio State rookies still to this day sets the all-time collegiate record for largest margin of victory. The Buckeyes have, of course, made enormous strides to improve the quality of their program over the last 50 years but, nevertheless, it is still a proud Michigan, who now boast nine NCAA national championship titles, that dominates the all-time series to date between these two legendary rival institutions by sporting the mark of 72 wins, 33 losses and 11 ties. Ohio State Buckeyes center R.J. UMBERGER (22), the native of Pittsburgh, Pennsylvania, who was the first round choice (# 16 overall) of the Vancouver Canucks at the 2001 National Hockey League Draft and later named NCAA (West) Second Team All-America in 2003, is double-teamed by the Michigan Wolverines pair of DAVID MOSS (18), the right wing who has been a regular in the NHL with the Calgary Flames and Phoenix Coyotes the past seven-plus years, and defenseman BRANDON ROGERS (5) during a Central Collegiate Hockey Association contest in Columbus more than a decade ago. Michigan have won seven of the last ten meetings between the two schools while claiming victory over Ohio State the last four times in succession. The Wolverines and Buckeyes faced-off against each other only twice during the final Central Collegiate Hockey Association campaign ever contested with head coach RED BERENSON’s charges sweeping the two games (5-3 and 6-3) last February at the Value City Arena in Columbus. It has been more than two years since Ohio State has appeared at the Yost Ice Arena in Ann Arbor but on that occasion it was the then # 14 Buckeyes who upended then # 7 Michigan twice (2-1 and 6-5). The University of Michigan will enter into this latest engagement with the eternal enemies ranked # 3 in both the USCHO.com as well as the USA Today/USA Hockey polls while Ohio State is currently rated # 22 by the former and # 21 by the latter. One of the most magical aspects of any true college hockey rivalry, however, is that the national polls and the all-time series record really does not amount to anything at all once the puck has been dropped yet again. And so only time will tell which team will go into the history books as the first school to win the inaugural Big Ten Conference men’s ice hockey match ever contested by these two titanic adversaries. Ohio State goaltender CAL HEETER (1), the 25-year-old native of St. Louis, Missouri, who has spent the past two seasons primarily tending the nets for the Adirondack Phantoms in the American Hockey League, lifts his stick to signify victory over the dreaded University of Michigan on the road at the Yost Ice Arena in Ann Arbor — this two game-sweep by the Buckeyes in November of 2011 marked the first time since 1986 that a visting Ohio State squad had been able to sweep the Wolverines on their own home ice.